If you have a passion for writing and you want to use your talent in this field to start working as a certified blogger, then you should know that a blogger certification course is now available at Brainmeasures. The blogger course offered by Brainmeasures is your ticket towards honing your skills in the field of blogging. It allows you to undergo a highly comprehensive blogger training which is sure to help you understand all the techniques and policies that you should follow when it comes to writing to make sure that you continue to capture the attention of your readers and drive traffic to your blogging site. This certification course also explains in detail all the features installed in Google Blogger, their individual functions and the different things that you can do to use the said features to your greatest advantage. Upon completion of this blogger certification course, you will be able to receive your certificate right away which will serve as a strong indication that you are one of the most skillful bloggers in the industry at present. 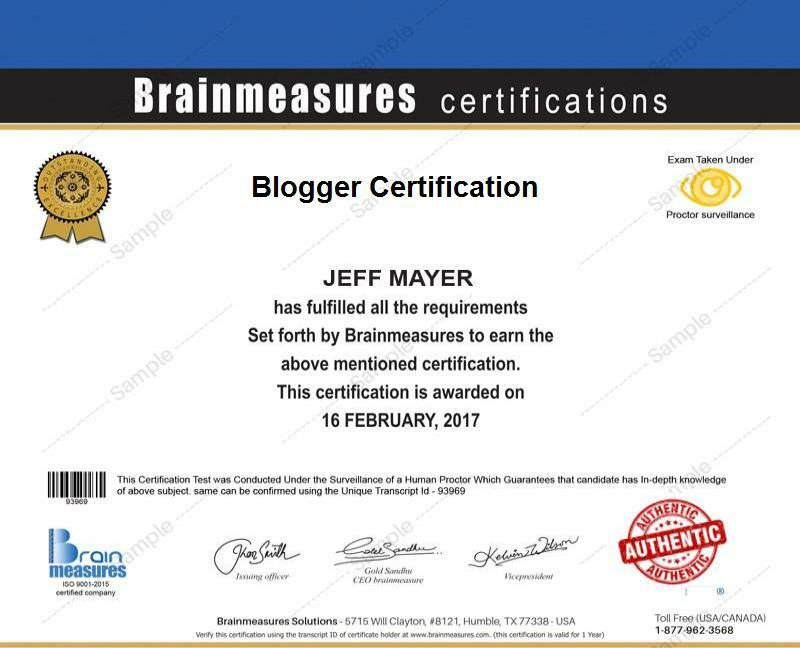 Anyone who is greatly interested about improving his skills in the field of blogging can enroll in the blogger certification program offered by Brainmeasures. It is suitable for aspiring writers who want to start earning money through blogging or any other individual who wishes to use Blogger as an avenue towards exposing his opinions about certain topics. The blogger certification course is a good way towards increasing your income especially if you plan to start working online. If you work as a blogger on a fulltime basis after you successfully complete your blogger certification course, then you will get the chance to earn around $45,000 to $70,000 per year. Note that you can further increase your income if you are able to drive traffic to your blogging site so you should continue to increase your knowledge about the most effective techniques that you can use in providing your blogs with the kind of exposure that it needs.